The world population has always been agrarian until recent times and the agrarian work included saving seeds for the following years crop. A keen eye has accompanied farmers who have been quick to spot changes and improvements in the natural world including crop plants. Rudimentary breeding in the form of selection would in more advanced cultures have been carried out. For thousands of years the world’s farmers have thus selected and adapted food plants to suit their environmental conditions, creating what we term ‘landraces’ and with that domesticated a cornucopia of diversity of food plants. Today we have to make a distinction between breeding methods. At the turn of the twentieth century all domesticated crop plants would be termed ‘open pollinated’. Soon into the century there were the beginnings of hybrid breeding, a science which has come to dominate crop breeding in the industrialised world. In 1969 already, 71% of the US maize acreage was planted with hybrids but of only 6 varieties. Today we have Open Pollinated breeding, F1 hybrid breeding, CMS hybrid breeding, and GM breeding. Open pollinated strains however, continue as the breeding material for hybrid varieties. Plant breeding involves 1), identifying and selecting for desirable characteristics or traits within a cultivar, or 2), the crossing of two or more distinct varieties or cultivars to transfer or breed-in desired characteristics – this may also involve wild plants. You then save seeds from the offspring. Those seeds are sown and further selected for desired characteristics. Seeds are continually saved from the best plants of each generation till you are happy with the outcome and desired characteristics have stabilised. Often the breeding of a new variety can take between 10 – 14 years depending on species. Objectives or reasons to choose certain characteristics can be varied, personal, and depending on circumstances include nutritional values, marketing requirements, yield, plant vigour, disease tolerance, appearance, colouration, tolerance to high or low rainfall conditions, hot, dry, or cool climates, soil types and soil nutrient availability, ease and time of harvesting, storage ability and more. Selecting for taste is less practiced but becoming more so. Open pollinated seed saving and plant breeding relies on a couple of simple facts or principles. 1) ‘Like breeds like’, yield breeds yield, taste breeds taste, earliness breeds earliness, resistance breeds resistance and the offspring will show up as ‘being true to type’. Offspring will on the whole resemble and take on characteristics from parent plants. The laws of nature ensure that inheritability is carried forward from generation to generation in a manner which is consistent. 2) Keep seeds from those plants which have the most desirable parents. Selection plays a key role in plant breeding. 1) Whether a plant is dioecious, (separate pollen bearing and fruit/seed bearing plants or male and female plants, like spinach, asparagus, hop and mulberry), monoecious (separate pollen and fruit bearing flowers but on the same plant like sweet corn, courgette, pumpkins and cucumbers), or perfect flowers (pollination and fruit/seed setting take place in the same flower, like peas, beans, tomatoes, carrots, beetroots, onions and so forth. 3) the plant’s means of propagation: whether a species is a cross breeder / cross-pollinator or an in-breeder / self-pollinator or a bit of both. Plants need insects for their pollination but a few species such as the beet family and corn/maize family and cereal rye grain require the wind for pollination. Cross-pollinated species rely on neighbouring plants of the same species for pollination. 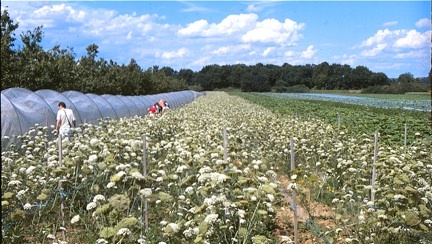 A minimum number of plants is always required to help maintain the overall genetic or biodiversity of a given variety. 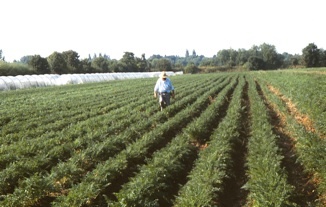 Always enough plants should be selected, if not, plants will move into in-breeding depression and start deteriorating, becoming smaller, lose vigour and run to seed earlier. Cross-pollinated species include carrots, parsnips, onions, leeks, beetroots, beet family, sweet corn, cucurbits, all brassicas, and many more. The cereal rye belongs to this group. Self-pollinated species in contrast rely entirely or largely on their own pollen for continuity. Such species regarding vegetables include especially lettuce, peas, and tomatoes, French climbing and dwarf beans, also but less so runner and broad beans, aubergines and peppers since they will partly cross with others. Strictly speaking just a few plants are sufficient to maintain biodiversity of a given variety and in-breeding depression is not an issue. For cereals, wheat, oat, and barley belong to this group. When growing a crop for seed, it is important to keep the variety pure and true to type. A cross pollinated species will cross with another closely related species including wild species and therefore needs to be sufficiently far away to prevent cross-pollination. With self-pollinated species the isolation distance requirements are much shorter when growing for seed. Breeding an open pollinated variety for public and market availability requires that a proposed variety is submitted for National Seed Registration. A new variety has to conform to being distinctly different from any other variety, to be sufficiently uniform and stable, also referred to as DUS, Distinct, Uniform and Stable requirements. A written description of a proposed variety’s characteristics is required. One needs to ask the question, are open pollinated varieties (especially of cross pollinated types) still being bred in the UK today? On inquiry the answer is very little. Maintenance breeding of existing varieties is still carried out. A special mention has to be made of the German Association of plant breeders ‘Kultursaat’ who work in accordance with Biodynamic principles. It is a not-for-profit association of 18 plant breeders and around 100 seed producers with a membership of farmers, breeders, home gardeners, and customers. It is mostly privately funded. Kultursaat was established in 1994 by the ’Initiatives Circle for Vegetable Seeds from Biodynamic Farming’ on the grounds that Biodynamic produce should not only come from Biodynamic or Organic seeds but from plant breeding aims based on insights out of Anthroposophy (wisdom of man). They work exclusively with open pollinated varieties (except for elements of de-hybridisation of hybrids to develop new open pollinated types) and have entered more than 50 new open pollinated varieties onto the market from 16 different species. as a task of mankind. Today we have a cornocupia of plant breeding: OP, F1 hybrid, CMS hybrid, GM. When you go vegetable shopping see if you can tell an OP vegetable from a hybrid. Ask the shop keeper if he knows. If he or she does not know, ask if they could look into labelling the vegetables, especially in an organic shop.